The dense greenery of the marginatum artificial plant can't be ignored! 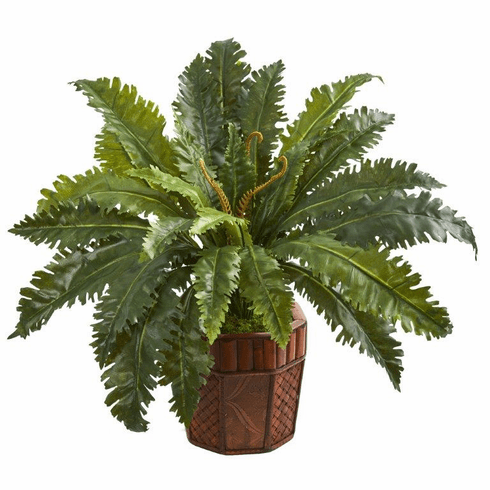 Its wavy, vivid green foliage extends outward and slightly drapes downward, giving it an ample appearance. It comes in a decorative bamboo finished planter. You can create a full, beautiful garden accent on your kitchen bar or island with this 25-inch ornament by surrounding it with other artificial plants and glassware. Size: Height: 25 In. Width: 28 In. Depth: 14 In. Pot Size: H: 8 In. W: 8 In. D: 8 In.